The Milton Community Band is a community concert band providing fun and camaraderie as well as a musical and educational experience for musicians of all ages. It aims to provide a recreational and entertaining experience for the citizens of Milton, Vermont and surrounding communities. The band was founded in August, 2001 by John Gordon and Bobbie Moser after organizing an ensemble to play for the July 4th parade in Milton. The band's first performance, in December 2001, was followed in 2002 with a series of summer concerts in Milton, Fairfax, Georgia, and So. Hero, Vermont; a performance at the opening ceremony at the Champlain Valley Fair; and a holiday concert in Milton. Since then our music has taken us all over the northwest corner of Vermont. Our members are a diverse group. 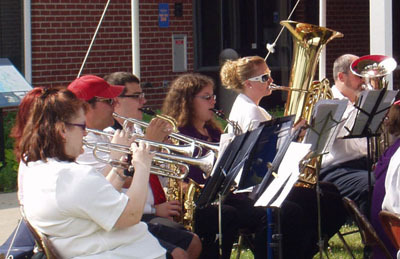 The Milton Community Band welcomes musicians of all ages and abilities, without audition. Members include high school students and community members who have returned to music after a break, as well as more experienced musicians. Current members reside in Milton and other towns in Chittenden, Franklin and Grand Isle Counties. New members are always welcome! Interested musicians are encouraged to attend rehearsal.